Sikhar Dhawan , Ken Williumson[c], Whridhiman Saha, Manish Pandey, Sakib AL Hasan, Yusuf Pathan, Mohammad Nabi, Rasid Khan, Basil Thumpi, Sandeep Sharma and Sidharth Kaul. KXIP is a well balanced team , This team have won 5 matches out of 6 match. Other good news for this team is Chris Gyle is fit to play who couldn't play last game due to injury. 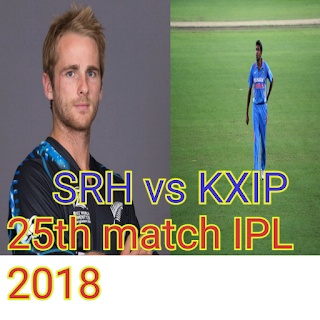 Other side SRH couldn't play well as compare to KXIP in previous matches. Bhubkumar of this team isn't quit fit so KXIP looking stronger than SRH.